This compendium/portmanteau film features the work of 13 European directors who were asked to represent aspects of Sarajevo’s turbulent history. The film was completed for the centenary of the 1914 assassination of Archduke Franz Ferdinand which triggered the First World War. Since then the city, which had been in Austrian-Hungarian control since 1978 after centuries as part of the Ottoman Empire, experienced a period as part of the Kingdom of Serbia, occupation by the Nazis who set up a puppet fascist state during the Second World War, become part of the post-war Yugoslavian Republic and then experienced the horrors of the Balkan Wars of the 1990s with a siege lasting four years. Now it is the capital of the Republic of Bosnia-Herzogovina. Each director has around 8-9 minutes to say something about Sarajevo and its story and the separate contributions are linked by an animation featuring representations of Sarajevo’s bridges. I need to confess first that my knowledge of the history of Sarajevo over the last 100 years is not what it should be and that the wars of the 1990s left me completely bewildered (having been a supporter of Tito’s Yugoslavia as a ‘non-aligned country’ in the Cold War). Perhaps because of this, I realised that I was drawing on my understanding of Michael Winterbottom’s Welcome to Sarajevo(UK 1997) in my attempts to understand these short films. I was surprised how much I’d absorbed from the script of that film by Frank Cottrell Boyce and how many of the incidents from that film were familiar in this new film. The thirteen directors, as indicated by the production nationalities above, come from several different countries. The four names most familiar to me directed contributions clustered together in the middle of the film. They are each quite distinctive. Jean-Luc Godard’s familiar large ‘banner’ statements in white upper case type are presented against still images and a montage of clips (I recognised at least one from Eisenstein). Similarly, Angela Schanelec shows us big close-ups of a small group of characters translating the statements of the 1914 assassin Gavrilo Princip with an un-blinking camera eye. Cristi Puiu offers us a long shot of a middle-aged couple in bed reading at Christmastime from a book which prompts the man to make several prejudicial remarks about various ethnicities and national groups in the Balkans – apparently it’s all the fault of Hungarians. 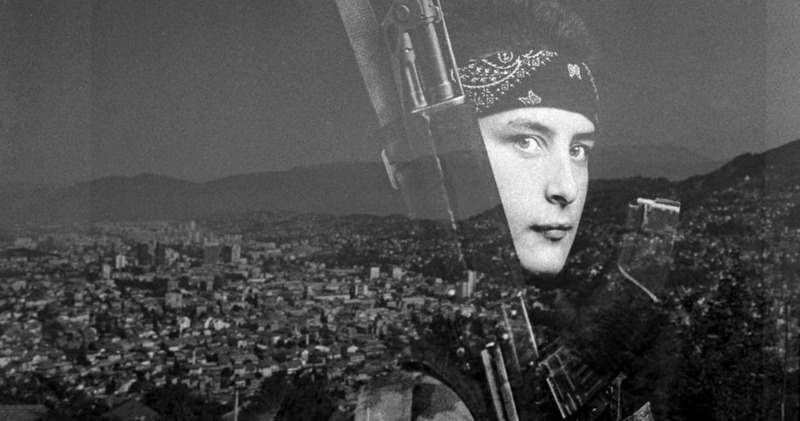 The most striking visual treatment is from Sergei Loznitsa who superimposes large still photographs of combatants over street scenes from Sarajevo (both images in black and white). These superimpositions are striking and provocative – see the image at the head of this posting. I’m not going to go through all thirteen contributions (but see below for more details). Inevitably, in a compendium film, some contributions work better than others for specific viewers – not because they are necessarily superior in terms of aesthetics, emotional impact or political sensibility, but often because of how they are juxtaposed with other contributions and how the rhythm of the overall film works for the viewer. I found some of the simpler personal stories about memory and migration and about family relationships to be not only affective in helping me to feel the impact of war, but also to remind me of the ways in which the Balkan Wars made their presence felt elsewhere in the world. The on-screen text at the end of Leonardo Di Costanzo’s contribution. It tells us that 240,000 of the 5.9 million Italians mobilised were either imprisoned or executed for desertion, indiscipline or ‘auto-mutilation’ in an attempt to get sent home. If you want a detailed description and an analysis of all the contributions you could try this review by Jay Weissberg in Variety. Weissberg knows a great deal about the history (or he is a very good researcher). His explanations of each contribution are helpful but I found some of his judgements made me very angry. I was particularly interested in the contribution of Italian director Leonardo Di Costanzo. His film doesn’t mention Sarajevo directly in its focus on Italian recruits fighting in the Dolomites in the Great War. It features a harassed officer forced to send out men to eliminate a sniper, who kills each one in turn. 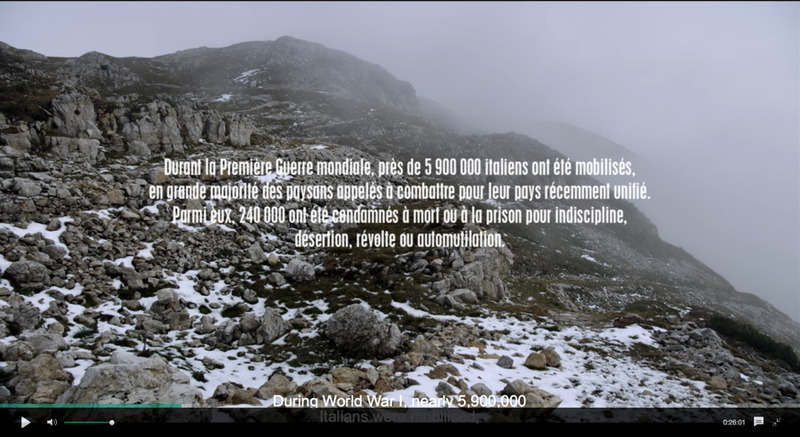 At the end of his film Di Costanzo presents some text informing us about the young men drawn into war to fight for a nation state only 70 years old. Weissberg comments: ” . . . such a didactic, straightforward approach would be better in a film made for high-school students”. What a silly statement. I’ve always found the Italian involvement in 1914 difficult to follow and I found the text helpful. The Italians fought against the Austrian-Hungarian forces and this film sits alongside the Cristi Puiu film (that Weissberg maintains is the best contribution) in identifying the nationalist rivalries which erupted in the break-up of the Austrian-Hungarian Empire and the Ottoman Empire which together controlled the whole of the Balkans before the rise of Serbia in the 19th century. I think this film is available on various online sites and it is certainly worth seeing if you want to learn more about the 20th century events in the Balkans which still reverberate with meanings today.